Having been a part of Premier Speedway’s Grand Annual Sprintcar Classic for the past two years, one of the World’s Most Iconic Brands will become a major part of Australia’s biggest Sprintcar event the South West Conveyancing Grand Annual Sprintcar Classic for at least the next three years, ensuring they will be a part of the 50th Anniversary Classic in 2022. The agreement has been struck with the Bird Group of Companies that own the franchise rights to KFC’s Ararat, Hamilton, Horsham, Maryborough, Mt. Gambier, Portland and Warrnambool stores. Naturally the Management team at Premier Speedway are very excited to be able to attract the support of such a recognizable and reputable supporter. “To be able to secure such an iconic and reputable company like KFC for not only next years Grand Annual Sprintcar Classic, but for the next three years is fantastic”, Premier Speedway General Manager David Mills said. “We take extreme pride in having had companies of National prominence see fit to become a part of the Premier Speedway and our events – especially the Grand Annual Sprintcar Classic”. “The generous offer, of a 10% discount for all ticket holders, that KFC extended to our patrons during the 2018-2019 season proved very popular, which shows that we have a loyal fan base that continues to support not only Premier Speedway but those that support us as well”, Mills added. “We look forward to KFC not only being a part of the next three Classic weekends, but also as a part of the Classic for many years to come. KFC is an iconic brand and we hope that the Classic continues to be an iconic event on the Speedway calendar as well”, Mills said. Bird Group of Companies representative Maddy Bird indicated she and the team at KFC Warrnambool were excited to be associated with one of Warrnambool’s biggest events. “The board and members of Premier Speedway should be very proud of what they bring to Warrnambool and our region, so for KFC to continue to be a part of the Grand Annual Sprintcar Classic for the next three years is something we are very excited about”, Bird said. “The support we have received from the Speedway Patrons over the current season has been great for us, and we look forward to working with David Mills to ensure we can make this grow again next season and beyond”, she added. KFC landed in Australia in 1968 when the first store was opened in Guildford, Sydney NSW. Today KFC serves 2 million customers every week (that's a lot of chicken) through over 600 stores across Australia. This makes KFC one of the largest fast food chains in the country. We are passionate about serving our customers freshly prepared, great tasting food with a key part of this being The Colonel's signature blend of 11 herbs and spices. Even today these remain a secret with the original recipe under lock and key in our headquarters in Kentucky, USA. 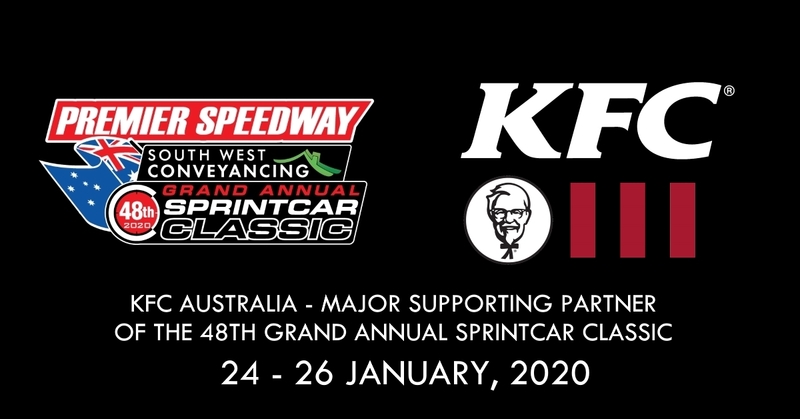 KFC now joins Performance Racegear, the Lady Bay Resort and KRE Race Engines as confirmed supporters of the Grand Annual Sprintcar Classic which will be held from Friday January 24 through to Sunday January 26, 2020. In addition to the supporting sponsorship agreements, please stay tuned for some exciting news with regards to our Naming Rights Partner.